Gilbert Hawkins is a Leonia resident and has exhibited extensively in New Jersey, New York, Pennsylvania and the Connecticut area. He has taught in several Universities and schools, notably PACE and New York University. His work has clean lines that encourage the viewer to look beyond the space and incorporate the sculpture in its environment. The edited form and well crafted metal have a strong presence that impacts its surroundings in surprising ways. 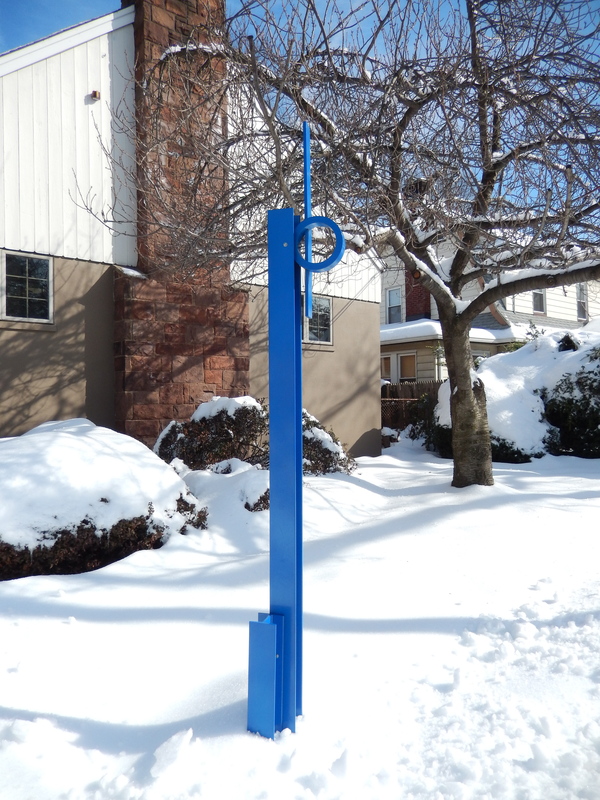 “Waldorf A”, in blue [powder colored steel, graces the front of the Annex Building. As the sculptor explains: “The title “Waldorf A” relates to the social genre of New York City in the late fifties. I recall the uniformed doormen of the hotels and posh apartment houses on Manhattan’s east side, polishing the brass door decorations while patrons passed unnoticing. The search for a literal name is quite inadequate nomenclature for the sculptural expression. “Waldorf A’ is a constructivist sculpture composed of shapes and forms found in architecture or industry. The individual pieces are bolted together, rather than welded, because a union created by bolting is both difficult and expressive. In ‘Waldorf A’ the viewer’s eye is drawn to the bisected strong circle at the top of the monolithic construction with each individual piece adding it’s own character to the overall composition.